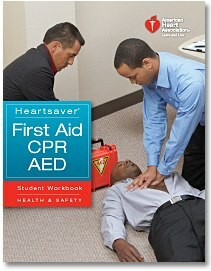 American Heart Association Heartsaver First Aid is intended for anyone who need a course completion card for their job, regulatory (e.g., OSHA), or other requirements. These courses can also be taken by anyone who wants to be prepared for an emergency in any setting. This course is also approved for US Coast Guard training. Describe the assessment and first aid actions for the following life-threatening conditions: heart attack, difficulty breathing, choking, severe bleeding, shock, and stroke . There is no written exam, Students must pass a skills test in order to qualify for an American Heart Association Heartsaver Course Completion Card.